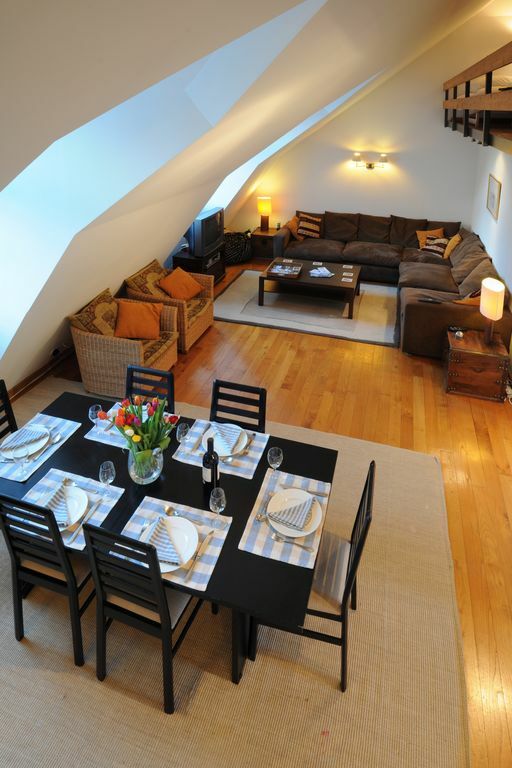 Our top floor apartment has been equipped as you would want your home to be. It is perfectly positioned next to the ESF office, ski school meeting point, Tourist Office and within five minutes walking of absolutely anything else that you might need. The modern living room has a fabulous view of Mont Blanc, with the bedrooms looking up the valley towards Les Grands Montets and Le Tour. The beds in the bedrooms have properly sprung mattresses with matching divans (by “And So to Bed”) and the L-shaped couch was made to order (by “Highly Sprung”), everything was bought with comfort in mind. The apartment is fully equipped with TV, UK satellite, DVD player, Hi-Fi, Wi-Fi, washing machine and dryer and a fully fitted kitchen. While a car is not necessary, many people feel that it makes life easier in the valley (particularly if you are skiing up at Les Grands Montets), we have a dedicated underground garage (so no scraping ice off in the morning). Winter in Chamonix: With such a high elevation and the micro climate created by Mont Blanc, Chamonix has a long snow-sure season. There are slopes for every level of skier or boarder and we are happy to discuss what will suit your needs. For beginners, meet your instructors next door in the morning. For intermediates, it is possible to wander over to the Savoy nursery slopes and take a very short drag lift up to the main Brevant lift to get access to the south facing slopes of there and Flegere (saves a walk up the hill in boots). The bus stop just 200 meters away (behind the Tourist Office) allows free transport to Le Tour (offerering a good mix of terrain for all levels) and Les Grands Montets with it's large north facing slopes giving some awesome off-piste opportunities. The lift for the Aguille du Midi, is a five minute walk, do take a guide for your safety if you plan to ski/board in the Vallee Blanche - it is stunning and worth the the cost of getting a professional to show you the way. Summer in Chamonix: The town of Chamonix is busy all year round, with walkers, climbers and golfers dominating the summer months. Days tend to be warm, but evenings are rarely oppressive as temperatures quickly cool to a comfortable level in the mountain atmosphere. There is much to do for all age groups, including climbing (try the indoor climbing wall in Les Houches with an instructor if you are a beginner), walking, golf, a great swimming pool, cycling, tennis, parapenting, fly fishing or just relaxing in a great atmosphere. Our favourite time of the summer is around the 21st June, when the whole of France has it’s 'fete de la musique' (what must be the biggest music festival in the world) and every bar seems to live music all absolutely free to watch. Children Are Welcome: Children essentials are stored in the ski cave with the apartment - a travel cot (for aged 3 or under), high chair, baby bath, safety gates, etc. Chamonix offers a number of baby-sitting services or children can be placed in ski school to allow yourselves to go off and ski. The French have a wonderful attitude to the young, with children being welcome in most bars and restaurants. Chamonix is no exception, with some of the best play parks and areas you will ever see. It is not unusual to see toddlers dancing in front of a stage in a bar as a band is playing (usually before the real apres-ski crowd arrive and it gets a little crowded for them). The apartment has unlimited how water. Seperate kitchen that is fully equipped. Owner was extremely responsive and friendly. Mezzanine level provide some additional space that was great to have. Spent a week in Jan 2019 in this lovely apartment. Really spacious and comfy with all amenities provided especially for a young baby we had in our care. Apartment block is quiet and the views out into the mountains are excellent. The location is perfect with really close proximity to the drag to take you up to the main Brevent cable car or a 5-8 minute walk the bus stop to take you to the other ski areas. The main high street in Chamonix is also practically on the door step. We all had a fantastic week and the hosts could not be more helpful or accommodating with our requests/ questions; wouldn't hesitate to book again! Great apartment in a great location. We enjoyed our stay in this lovely apartment that has everything you need to enjoy your stay. While we did not cook during our stay beyond making coffee, we did enjoy the stovetop espresso maker. Alisdair went above and beyond in helping us to make dinner reservations, hiring guides, and understanding the area, etc. Thank you for all of your help!! Lovely spacious and clean apartment with everything that could need for your stay. Great location but also just far enough away from any noise. Amazing views out the windows of the mountains and glacier. Hosts were very helpful to ensure we had everything we needed for our stay. Many thanks ..will stay here again! Thank you for taking the time to review our apartment. We're glad you had a good time and enjoyed your holiday and look forward to welcoming you back soon. 1. Location - you can't get a more central located place in Chamonix - everything in town is within walking distance. The apartment is very private, quiet and safe. 2. Functionality - it is well equipped and modern and kept in a very high standard. 3. Value for money - it was everything we dreamed of for a holiday. 4. Did I enjoy staying there - absolutely, could pace ourselves to do everything below. 5. What to do - The list of things to do in Chamonix is endless - from using all the cable cars to the different peaks, walking in a glacier, playing golf, strolling through the forest and hiking, strolling through town and to have all the restaurants on your doorstep and public transport is easily available - for sure a holiday for everybody. The view of the mountains is incredible from the apartment. Very nice place with a great location. Some sort of fan for the loft would help with the overheating upstairs. So happy you had a great holiday and thank you for the recommendation. We have not heard that the mezzanine can get too warm before - this may be down to the new windows that we replaced in the spring being more efficient. We will make sure we have a fan upstairs in the future for when the weather is so warm. The residence is ideally situated at the top of a lane that enters directly onto the main pedestrian street of the town centre. This location ensures a quiet stay, while being in the heart of the town. There is very little that is more than five minutes walk from the apartment. There is a ski rental shop on the ground floor of the residence itself. Within 100 meters of the front door are the ESF office and the meeting point for ski/board lessons, the Tourist Office, a bakery, a supermarket and the main street with it’s selection of bars, restaurants and shops. Within 200 meters are the nursery slope of Le Savoy (where the ESF have a children’s ski camp and you can take a drag to the main Brevant ski lift) and the bus stop for free transport to Le Tour and Grands Montets. If you have transport, within easy access are Courmayeur (there is a free bus during the ski season), Verbier, Megeve, Flain, Geneva, Annecy and Lausanne. All offer a chance to see/ski something different. Golf: The Golf Club de Chamonix has an 18 hole course designed by Robert Trent Jones senior. A beautiful course with fabulous views of Mont Blanc and the mountains around. The course is open from May/June (depends upon when the snow clears) to late Autumn and the arrival of the snow again. All equipment (except shoes and clothing) may be rented at the shop. They have a web-site and it is worth checking out if you are considering playing in the summer months. The golf course at Verbier is an hour from Chamonix and that at Crans-Montana is an hour and a half from Chamonix. Ski: Chamonix is a famous ski resort that is good for beginners (well maintained nursery slopes in town and at Le Tour), good also for intermediates and experts. The skiing is arranged over five distinct areas that are served by a free shuttle bus service, including access to the Vallee Blanche. We have spent the whole of the past twelve winters in the valley and have taken numerous friends skiing/boarding that have ranged from total beginners to extreme skiers and everything in between. Please do contact us if you wish to discuss the skiing (we are happy to talk about the valley even if you don’t want to rent the apartment). Rates do not include Tourist Tax (€1 per night per adult), but does include linen, towels, utilities and use of the garage. We provide cots and other baby equipment at no charge. We offer a 2.5% reduction for payments made directly to our bank accounts in either EUR or GB£.